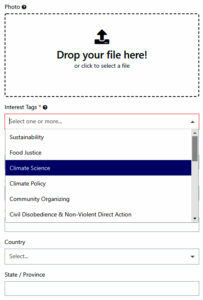 After you click the hyperlink to verify your email address, you will be taken to a window where you can click a button to log into Create Climate Justice Net (CCJnet) for the first time. When you log in, using the email and password that you chose, you will be taken to the CCJ Net user platform. Most of the site functionality is based on you being in one or more member Groups. If you click on Groups in the navigation menu on the left you’ll find links to groups that you have joined as well as a list of groups that are currently featured. You can find groups to join by clicking the Search Groups button at the top of the Groups page. You are encouraged to join the UU Environmental Justice Practitioners Network and UU Climate Action Network, which will be listed in Featured Groups. You’re also encouraged to create a new group for your congregation or other relevant organizations. Create Climate Justice Net is built using modern web technologies that the Microsoft Internet Explorer or Microsoft Edge browsers don’t always play well with. If you’re using one of these browsers, we strongly encourage you to download and install either the Mozilla Firefox or Google Chrome web browser. You next will be taken to another pop-up window, Update Your Profile, where you may add personal information and a photo. Some fields are required, others are optional. Please provide as much information as you feel comfortable sharing, so other members may more easily network with you on issues related to your geographic location and/or interests. Adding your full address helps us identify which voting precinct you live in. “Faith community” might be your primary Unitarian Universalist congregation or organization. You can upload a profile photo, and specify your personal interests such as renewable energy, worship, community organizing and social justice. Interest tags help people with similar interests find each other, which is useful for organizing. If you have feedback about how to improve the selection of interest tags, you can share this feedback through the contact form. When finished, click the blue Save button in the bottom right corner. If you want to add to or edit your profile information later, go to your profile page and click the orange button in the upper right that says Edit My Profile.